It’s lunchtime on a typical Thursday at Redfin’s downtown Seattle headquarters, and the entire staff has gathered in a massive dining room overlooking Elliott Bay. On the menu: sushi. Redfin’s employees eat together here three times each week, with departments mingling over all kinds of cuisine. Redfin, which combines a web-based real estate search tool with actual brokerage services, goes far beyond providing lunches. 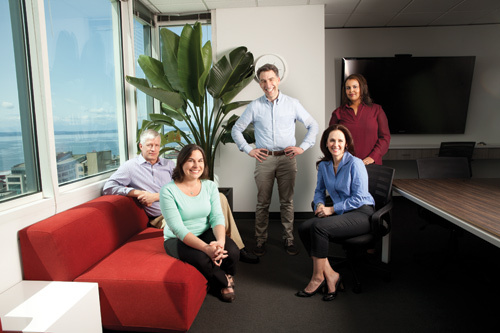 Although it operates in 25 markets throughout the United States, Redfin’s Seattle headquarters is the epicenter of its game-changing corporate culture. On most afternoons, software engineers gather for a 30-minute workout in a conference space. Employees hold impromptu happy hours in the spacious lounge — with occasional ping pong tournaments breaking out. Redfin doesn’t just look like a great place to work, though. The company provides generous benefits, especially PTO. Each staffer is eligible for a sabbatical after five years of employment. And the company’s lines of communication are as open as any we’ve seen. Has a former president of Mexico ever spoken at one of your company’s monthly lunches? Has your boss ever given you a week to design and create any piece of technology you desired? If you answered “yes,” you work for Zillow, the online real estate marketplace that has transformed the industry. Zillow attracts top-tier talent to its sparkling headquarters in Seattle’s Russell Investments Center with an unparalleled atmosphere of creativity and fun. One software engineer even used his semiannual Hack Week to create a “smart kegerator,” complete with Android-linked monitor for keg level and temperature. Since 2007, the mortgage industry hasn’t exactly been sunshine and daisies. Thanks to a committed workforce, Evergreen Home Loans has weathered the storm. With 28 branches in seven western states, the Bellevue-based mortgage firm treats its workers like gold. For starters, they receive industry-leading health insurance and PTO benefits. Each year, Evergreen pays for $500 of continuing education costs, covers eight volunteer hours and matches $250 in charitable giving per employee.